2 doc. 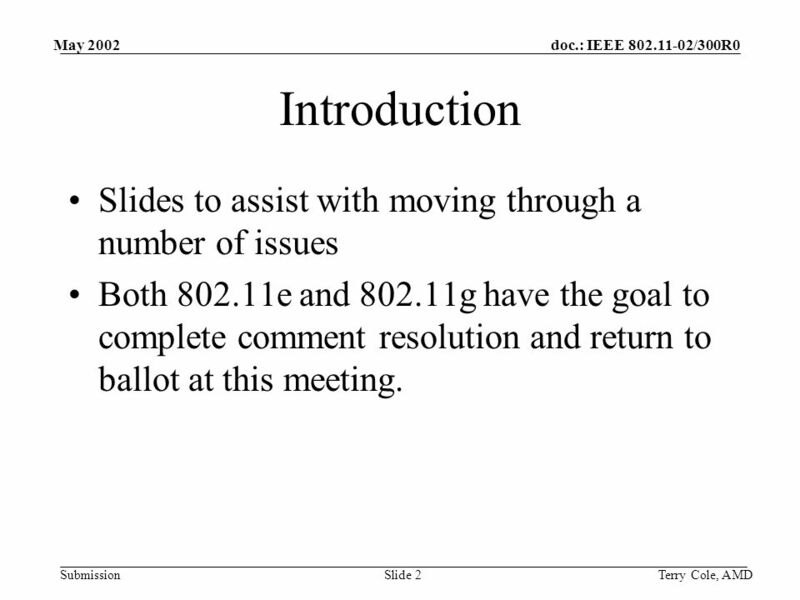 : IEEE 802.11-02/300R0 Submission May 2002 Terry Cole, AMDSlide 2 Introduction Slides to assist with moving through a number of issues Both 802.11e and 802.11g have the goal to complete comment resolution and return to ballot at this meeting. 4 doc. : IEEE 802.11-02/300R0 Submission May 2002 Terry Cole, AMDSlide 4 Capability Bit Overloading Approved bits (802.11a and 802.11d none) –802.11-1999 has b0 to b4 (ESS, IBSS, CF Pollable, CF Poll Request, Privacy) –802.11b added b5, b6, b7: (Short, PBCC, Channel Agility) Balloted bits (802.15.2 and 802.11f none) –802.11h proposes: b8 (Spectrum Management) –802.11i proposes: b11 (Enhanced Security) –802.11g proposes b8 and b9 (ER-PBCC, CCK-OFDM) –802.11e proposes b8, b9, b10, b15 (qos, fec, bridge portal, extended capability element) Observations –TgH, TgE, and TgG are all using b8! –8 bits are available and 8 bits are being added! 6 doc. 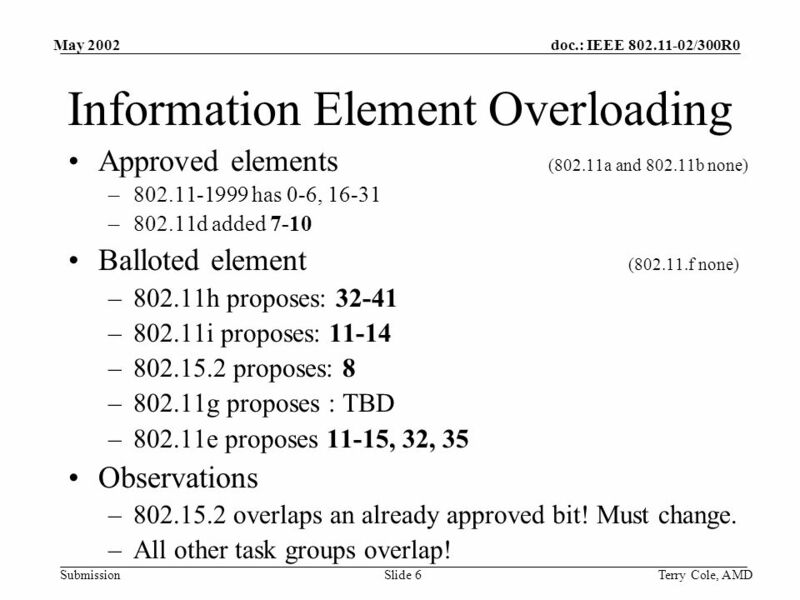 : IEEE 802.11-02/300R0 Submission May 2002 Terry Cole, AMDSlide 6 Information Element Overloading Approved elements (802.11a and 802.11b none) –802.11-1999 has 0-6, 16-31 –802.11d added 7-10 Balloted element (802.11.f none) –802.11h proposes: 32-41 –802.11i proposes: 11-14 –802.15.2 proposes: 8 –802.11g proposes : TBD –802.11e proposes 11-15, 32, 35 Observations –802.15.2 overlaps an already approved bit! Must change. –All other task groups overlap! 7 doc. 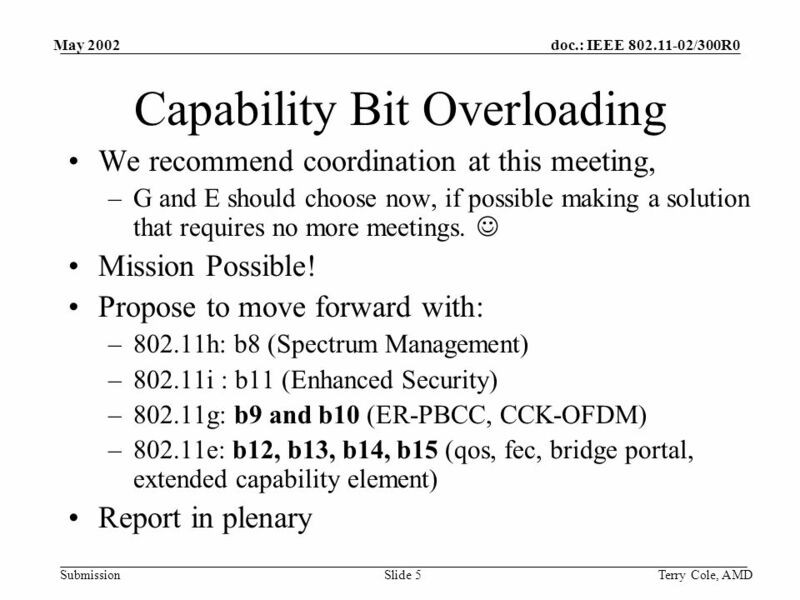 : IEEE 802.11-02/300R0 Submission May 2002 Terry Cole, AMDSlide 7 Information Element Overloading We recommend coordination at this meeting, –G and E should choose now, if possible making a solution that requires no more meetings. Mission (almost) Possible! 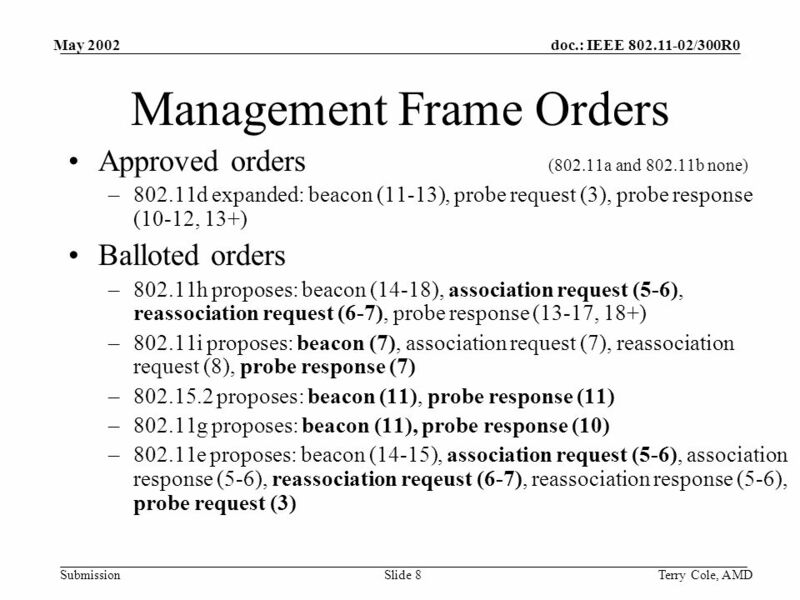 Propose to move forward with: –802.11i keeps: 11-14 –802.11h keeps: 32-41 –802.15.2 is asked to take: 63 –802.11g takes: 43 –802.11e changes to: 44-50 Report in plenary. 10 doc. 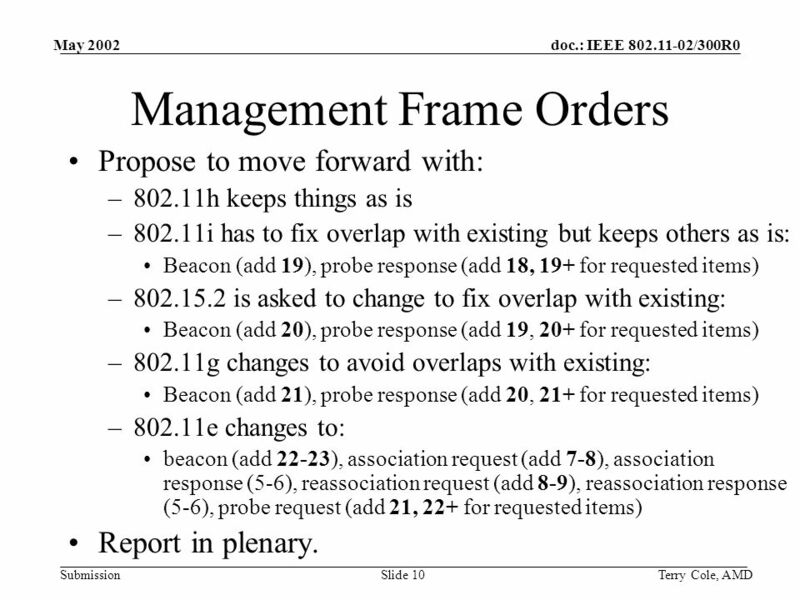 : IEEE 802.11-02/300R0 Submission May 2002 Terry Cole, AMDSlide 10 Management Frame Orders Propose to move forward with: –802.11h keeps things as is –802.11i has to fix overlap with existing but keeps others as is: Beacon (add 19), probe response (add 18, 19+ for requested items) –802.15.2 is asked to change to fix overlap with existing: Beacon (add 20), probe response (add 19, 20+ for requested items) –802.11g changes to avoid overlaps with existing: Beacon (add 21), probe response (add 20, 21+ for requested items) –802.11e changes to: beacon (add 22-23), association request (add 7-8), association response (5-6), reassociation request (add 8-9), reassociation response (5-6), probe request (add 21, 22+ for requested items) Report in plenary. 11 doc. 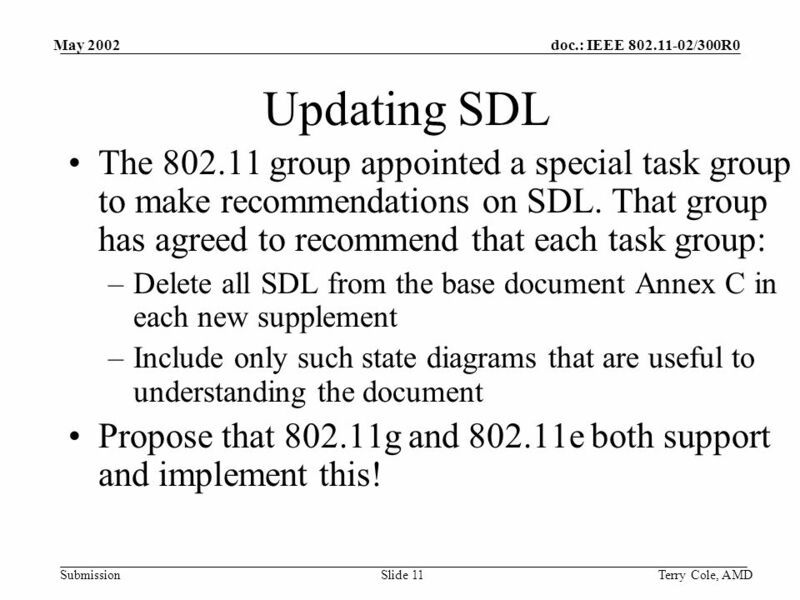 : IEEE 802.11-02/300R0 Submission May 2002 Terry Cole, AMDSlide 11 Updating SDL The 802.11 group appointed a special task group to make recommendations on SDL. That group has agreed to recommend that each task group: –Delete all SDL from the base document Annex C in each new supplement –Include only such state diagrams that are useful to understanding the document Propose that 802.11g and 802.11e both support and implement this! 15 doc. 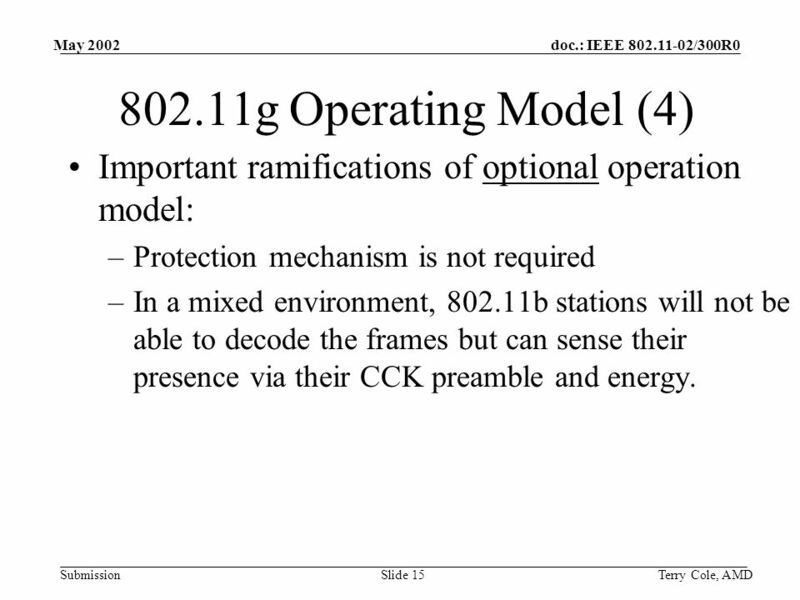 : IEEE 802.11-02/300R0 Submission May 2002 Terry Cole, AMDSlide 15 802.11g Operating Model (4) Important ramifications of optional operation model: –Protection mechanism is not required –In a mixed environment, 802.11b stations will not be able to decode the frames but can sense their presence via their CCK preamble and energy. 16 doc. 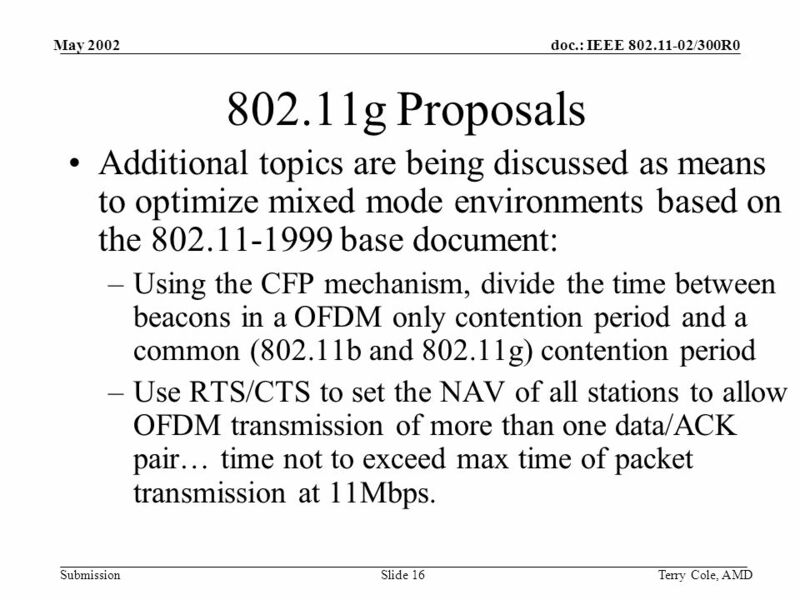 : IEEE 802.11-02/300R0 Submission May 2002 Terry Cole, AMDSlide 16 802.11g Proposals Additional topics are being discussed as means to optimize mixed mode environments based on the 802.11-1999 base document: –Using the CFP mechanism, divide the time between beacons in a OFDM only contention period and a common (802.11b and 802.11g) contention period –Use RTS/CTS to set the NAV of all stations to allow OFDM transmission of more than one data/ACK pair… time not to exceed max time of packet transmission at 11Mbps. 17 doc. 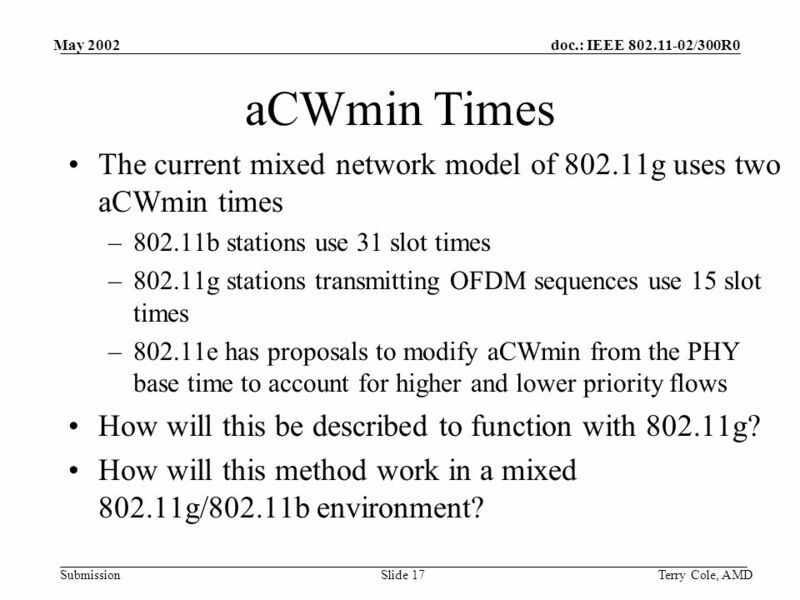 : IEEE 802.11-02/300R0 Submission May 2002 Terry Cole, AMDSlide 17 aCWmin Times The current mixed network model of 802.11g uses two aCWmin times –802.11b stations use 31 slot times –802.11g stations transmitting OFDM sequences use 15 slot times –802.11e has proposals to modify aCWmin from the PHY base time to account for higher and lower priority flows How will this be described to function with 802.11g? How will this method work in a mixed 802.11g/802.11b environment? 18 doc. 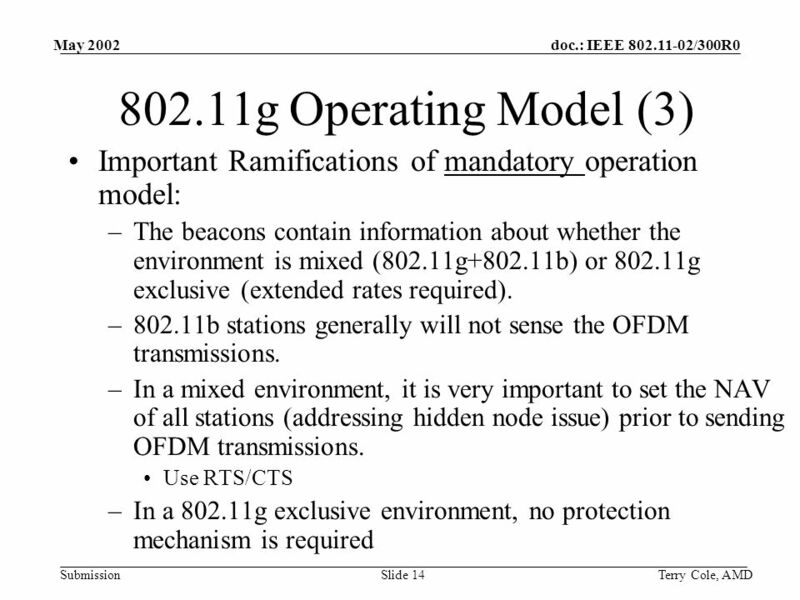 : IEEE 802.11-02/300R0 Submission May 2002 Terry Cole, AMDSlide 18 Superframes Currently, 802.11g maintains the superframe structure loosely implied by the base 802.11-1999 document –Approximately uniformly spaced beacons –Some beacons followed by a contention free period used for polling by the AP We have a proposal (02/301) to modify this: –A CCK beacons followed by a contention free announcement, immediately followed by an OFDM CF-END. 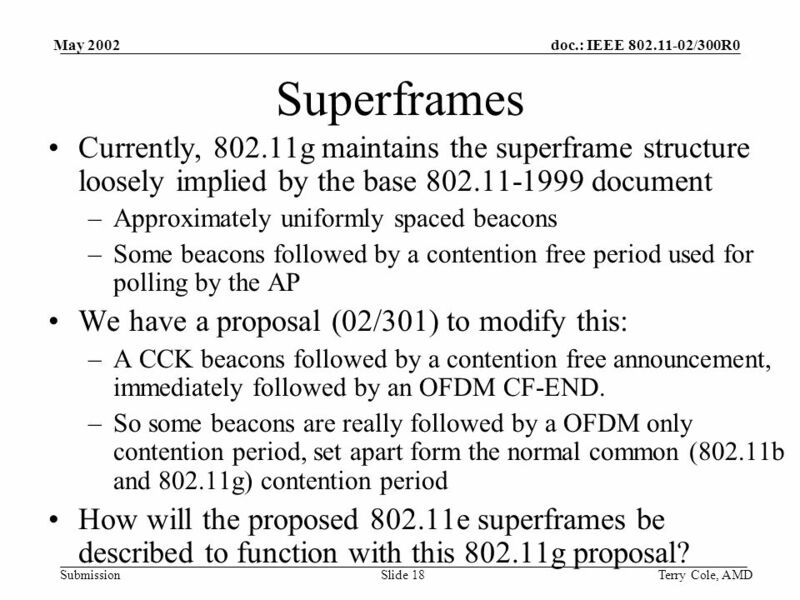 –So some beacons are really followed by a OFDM only contention period, set apart form the normal common (802.11b and 802.11g) contention period How will the proposed 802.11e superframes be described to function with this 802.11g proposal? 19 doc. 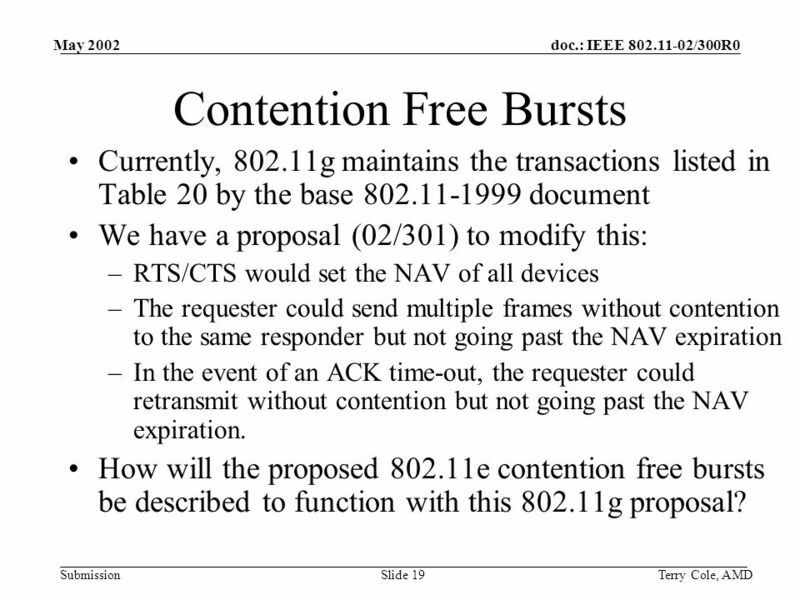 : IEEE 802.11-02/300R0 Submission May 2002 Terry Cole, AMDSlide 19 Contention Free Bursts Currently, 802.11g maintains the transactions listed in Table 20 by the base 802.11-1999 document We have a proposal (02/301) to modify this: –RTS/CTS would set the NAV of all devices –The requester could send multiple frames without contention to the same responder but not going past the NAV expiration –In the event of an ACK time-out, the requester could retransmit without contention but not going past the NAV expiration. 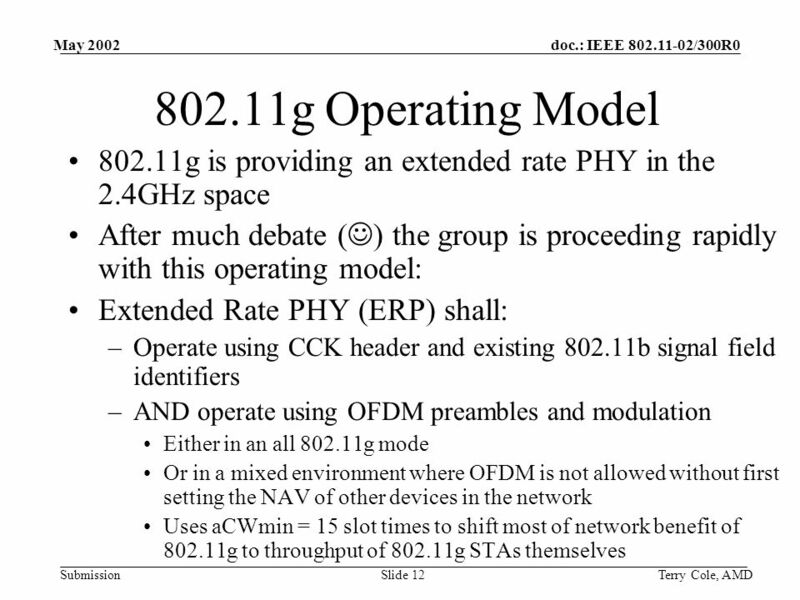 How will the proposed 802.11e contention free bursts be described to function with this 802.11g proposal? Download ppt "Doc. : IEEE 802.11-02/300R0 Submission May 2002 Terry Cole, AMDSlide 1 Slides to Assist with Joint Meeting of TgE and TgG Terry Cole AMD Fellow"
Doc. 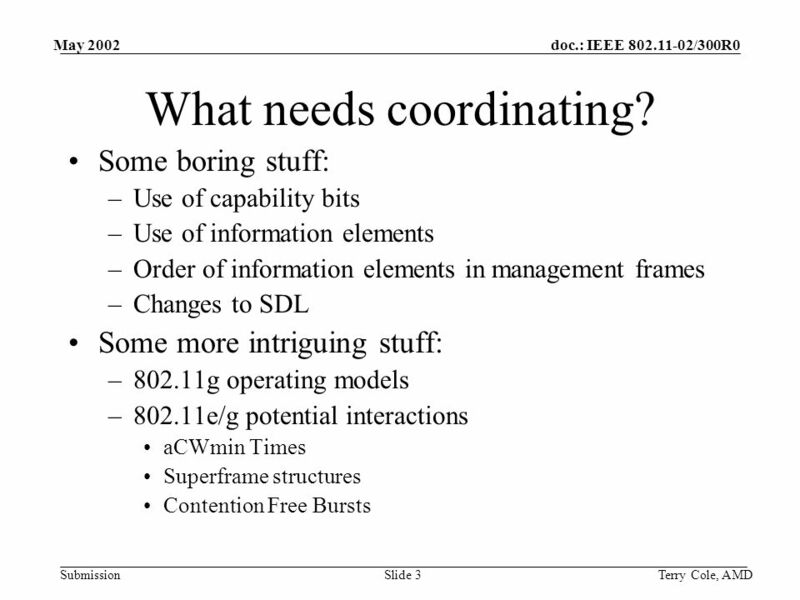 : IEEE /061r0 Submission January 2001 Mark Schrader, Eastman Kodak CompanySlide 1 Project: IEEE P Working Group for Wireless Personal. Doc. 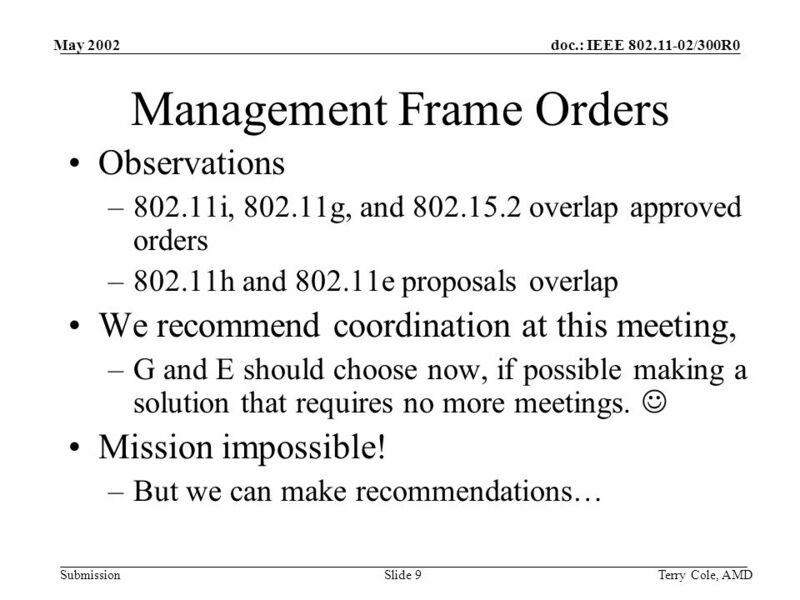 : IEEE /272a Submission June 2001 S. Choi, Philips Research Slide 1 Problems with IEEE (e) NAV Operation and ONAV Proposal Javier del. 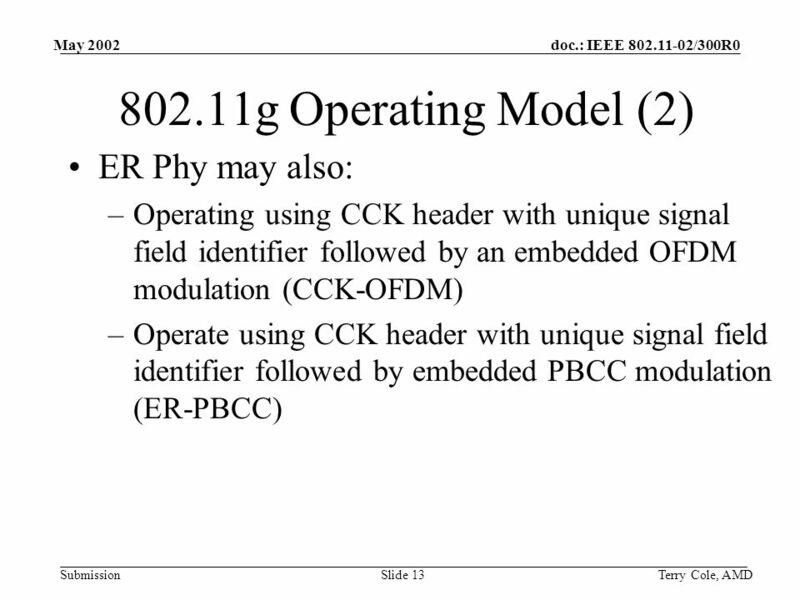 Doc: IEEE /705ar0 Submission Javier del Prado et. al November 2002 Slide 1 Mandatory TSPEC Parameters and Reference Design of a Simple Scheduler. Doc. : IEEE /0509r0 SubmissionSlide 1 Short Management and Short A-MSDU Frame Date: Authors: Liwen Chu, ST May 2013. Doc. : IEEE /0165r1 SubmissionPäivi Ruuska, NokiaSlide 1 Implementation aspects of a coexistence system Notice: This document has been. Doc. 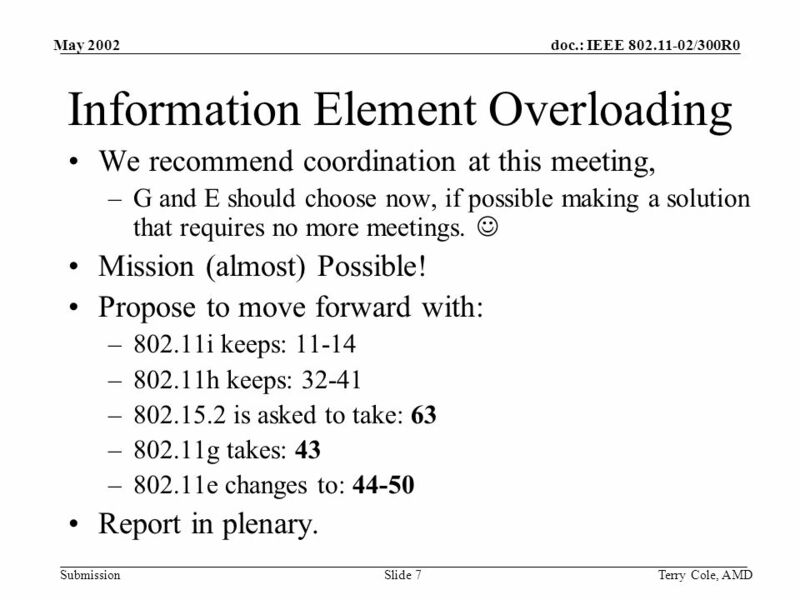 : IEEE /372r0 A New Approach to the NAV June, 2001 Matthew Sherman, AT&T Labs - ResearchSlide 1 A New Approach to the NAV Author: Matthew. Doc. : IEEE /080r0A Submission January 2003 Black/Kasslin/Sinivaara, NokiaSlide 1 A Framework for RRM Simon Black, Mika Kasslin, Hasse Sinivaara. Doc. : IEEE /412r0 Submission S. Choi, Philips Research July 2001 Slide 1 Aligning e HCF and h TPC Operations Amjad Soomro, Sunghyun. Doc. : IEEE /301R0 Submission May 2002 Terry Cole, AMDSlide 1 A More Efficient Protection Mechanism Terry Cole AMD Fellow +1. Doc. : IEEE /081r0 Submission January 2001 Shoemake, Texas InstrumentsSlide 1 Project: IEEE P Working Group for Wireless Personal Area Networks. Doc. : IEEE /0789r0 Submission May 2007 Terry Cole, AMDSlide WG Assigned Numbers Terry Cole AMD. Doc. : IEEE 802.15-01/081r0 Submission January 2001 Shoemake, Texas InstrumentsSlide 1 Project: IEEE P802.15 Working Group for Wireless Personal Area Networks.